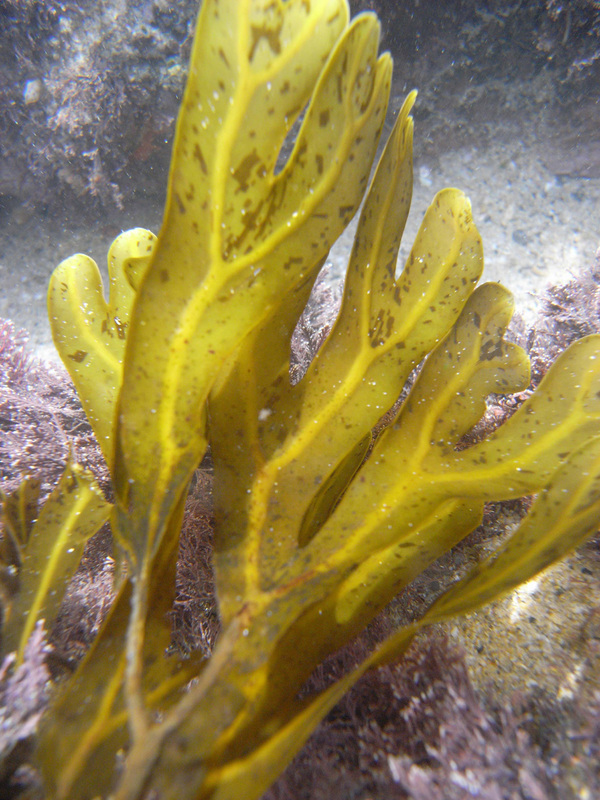 Plants brown to yellowish-brown, up to 30 cm tall, blades strap-shaped, subdichotomously branched, with lighter coloured midrib and smooth margins; holdfast a mat of rhizoids. Blades 1-1.5 cm wide throughout, midrib ca. 3 mm wide; blade wings ca. 200 µm thick, midrib ca. 400 µm thick. Hairs in tufts, forming obliquely-oriented lines from midrib towards margins. Cortex a single layer of densely pigmented cells 15-18 µm deep x 10-13 µm wide. Medulla up to 6 cells deep in outer wings of blade, up to 14 cells deep in midrib. Medullary cells in obvious rows, variable in shape from polygonal to elongated, smaller near thallus edge. Sporangia ca. 100 µm in diameter, dividing tetrahedrally when mature; in sori on both sides of midrib, almost completely embedded in cortex. Gametangia not seen. Common in the lower eulittoral and shallow subtidal zones. Recorded from the Cape Agulhas region to Black Rock in northern Kwazulu-Natal (22-58). Type locality: Algoa Bay (Silva et al. 1996). Note: Stegenga et al. (1997) considered that D. ligulata was the correct name for the species known as D. longifolia (Papenfuss, nom. inval.). Nevertheless there may be more species of Dictyopteris present on the South Coast and this group needs re-investigation in South Africa. Dictyopteris ligulata, Port Alfred, showing characteristic markings. 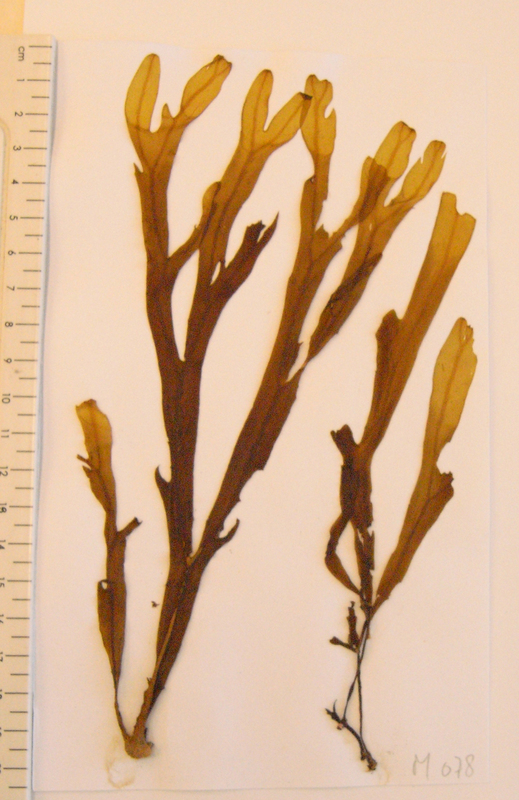 Dictyopteris ligulata (herbarium specimen, Dome Bluff, Transkei).